Since morning, people have already stand by next to the Mempawah river, about 200 meters form the estuary. Some young couples came by motorcycles, some families came by private cars, some of those people came by bus and truck. Eventually, about 200 meters from the location is bog down. Throughout the street, there are so many merchantmen sell their products such as clothes, beverages, accessories, VCD, DVD and other things. Even the weather so hot and ting, the sun shining so bright, it’s not loosen the people desirable to come in here. Their destination is only one, watch the robok-robok while shopping and enjoy the free entertainment. Some foreign tourists appear in the middle of thousand local people. On the field, some invitation guess has already sat on the chairs roofed with big tent facing the river. Not for a long time then yellow boat carry Pangeran Ratu group from Amantubillah Pallace, DR Ir Martian Adijaya Kesuma Ibrahim, MSc move to the side of the Mempawah river about 20 meters from the guess chairs. 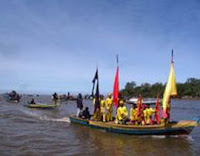 When entering the Mempawah mouth, Pangeran Ratu was picked up by prince and some punggawa keraton using yellow lancing. Then, the prince do the offerings ritual, on the ocean to push away all disasters. Next, Pangeran Ratu and the queen consort visit upon the guess, while prince come back to the palace. This year, robok-robok was celebrated different than last years. 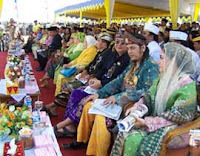 This year celebration was concentratable at the Mempawah river presented by King and Queen and some keraton in Indonesia. They become special guess. After the ceremonial opening Keraton National Art and C ulture II and West Kalimantan Festival of Malay Art and Culture IV, all guess were entertained with west Kalimantan dance, anging mamiri (from Bugis-South Sulawesi), Malay welcome dance and 6 girls dance. After the Closing prayer, Kings, Queens and all guess invited by the queen to have lunch inside the Amantubillah palace. This lunch procession use saprahan tradition (eating together ala coastal area people). After that, some guess make a devotional visit to a sacred place to Ompu Daeng Manambon. The meaning pf robok-robok tradition is a welcome mat of Ompu Daeng Manambon. Robok-robok was believed as united massage from all ethnic and religion in West Kalimantan. That massage was a legacy, left by Ompu Daeng Manambon when he establish Mempawah city. Another evidence of the harmony can be seen in the Ompu Daeng Manambon funeral complex. In that funeral, there are Dayak Black commander’s, Patih Humantir’s and Damarwulan’s (Java man), Lo Tai (Chinese man), and some other ethnic grave. 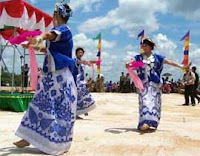 Just like years before, the robok-robok celebration has become one of the national tourism agenda and a free charge entertainment for the local people. Many attraction were showed such as water motor, traditional dress and custom, qasidah, traditional song karaoke, hadrah, albarzanji, panjat pinang (banana tree climb contest), smack pillow, tarik tambang (pull rope contest), ping pong, volley ball, soccer, dugout contest, traditional dance, and other art attraction from Pontianak. These activities were held at the next of the Mempawah river from morning until night. For some local people, Robok-robok is a blessing. They earn money by selling products and souvenirs around that location. Usually they start to sell a week before and after the robok-robok celebration.